The fitness industry would like you to believe you can’t possibly get fit without spending hundreds (or even thousands) of dollars on everything from gym memberships and personal trainers to fancy compression gear and workout gadgets. The fitness industry is lying. You don’t need the bank account of a Kardashian to get in the best shape of your life -- you just need about $50 and a little self-motivation (which, let’s be real, is the hardest part). Pick up one or two resistance bands ($12-$19 each), a basic jump rope (about $15), and a sturdy bar (you can buy a 4ft steel pipe from Home Depot for $15) to completely replace most of the equipment found at a gym. Did you know a commercial StepMill costs about $7,000? C’mon, it’s just a set of moving stairs. There’s absolutely no reason you can’t replace it with your own set of stairs (or even just a couple steps). How to do it: Try walking up once, running up once, taking steps two at a time, then stepping up sideways, leading with each leg. Continue cycling through the series for about 20 minutes to raise your heart rate and strengthen your legs. Don't jog -- jump rope! 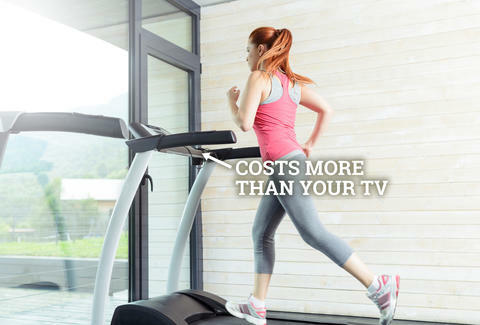 Commercial treadmills range in price from $4,000 to $10,000, but unless you’re training for a marathon, you really don’t need to shell out the cash for one of your own. How to do it: Just jump rope! Jumping rope requires a whole lot less space and money, and it’s every bit as good of a workout -- it’s actually lower impact than running, but is still considered a high-intensity exercise. This means you can strengthen your heart and lungs without destroying your knees. When you consider the cost of a squat rack, a bar, and all the associated plate weights, commercial gyms spend well over $2,500 to help you kill your glutes and quads. Mimic the same exercise at home by simply stringing your sturdy bar through two of the loops on your CLX band. How to do it: Stand on the center of the band, your feet hip-distance apart, and position the bar across your shoulders. Press your hips back to perform the squat, just as you would on a squat rack, then return to standing, pressing against the resistance of the bar and band. Increase the resistance by choosing a heavy-duty band, or by stringing the bar through loops closer to the center of the band. Commercial bench presses cost about the same as squat racks, and, just as simply, they can be replaced with a band and bar. How to do it: Sit on the ground, looping the center of the band around your back. Slide your bar through two of the loops on the CLX band (the band should be taut when your elbows are bent at 90 degrees in front of your chest). Lie back and center the bar over your chest with your elbows bent. Press the bar straight up against the band’s resistance, and return to start. I know glute kickback machines have a major fan following, but when I managed gyms, I refused to purchase them. They cost thousands of dollars and are highly unnecessary. 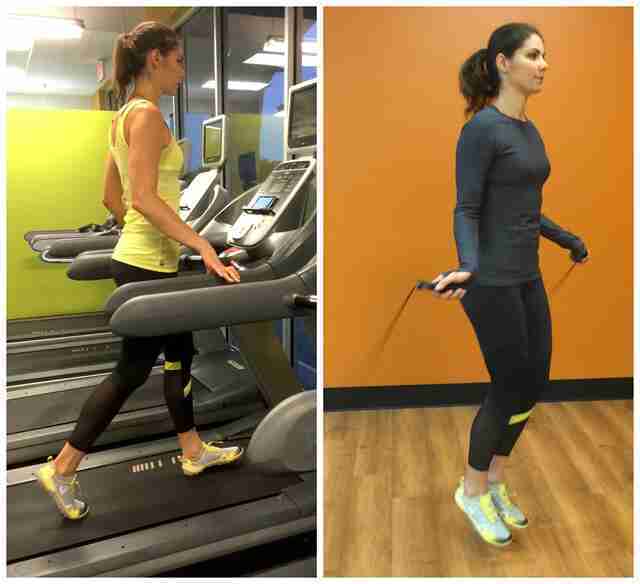 How to do it: To perform the same exercise, all you need is a resistance band. Sit on your knees and loop the ends of the CLX band over each foot, then come to a tabletop position on your hands and knees, holding the center of the band with each hand directly under your shoulders. Press one leg straight back, with your foot flexed, extending your knee and hip as you squeeze your glute. Return to start and switch legs. Seated rows often come as part of a giant cable crossover system that costs upwards of $10,000. Home versions, of course, cost less, but they’re still a pretty penny. Why spend the bennies when you do the same exercise with your trusty band-and-bar alternative? How to do it: Sit on the ground and string your bar through two of the loops of your CLX band. Bend your knees slightly and place the center of the band around the soles of your feet. With your arms extended fully, the band should be taut. Bend your elbows and squeeze your shoulder blades together as you pull the bar toward your torso. Return to start. You know the drill by now -- this band-bar combo really works. How to do it: Sit on a chair so the center of the band is under your glutes and grasp the bar at shoulder height. Press straight up against the resistance of the band as you extend your arms overhead. Return to start. Like the seated row, triceps pressdown machines are often part of a larger cable-crossover system. But you don’t need a stack of weight plates to workout your tris. How to do it: Simply loop the center of your CLX band over any sturdy object. I used the handle of a spin bike, but you could use a door knob, a pullup bar or a towel rack, just as long as the object won’t move when you pull against it. Stand or kneel in front of the object (depending on its height), and bend your elbows to 90-degrees grasping two of the CLX band’s loops so that the band is taut when your arms are bent. Press straight down and back as you extend your arms and engage your triceps. Hold for a count, then return to start. Laura Williams is an exercise physiologist and former gym manager who hates hearing people say it costs too much to get fit. Find out her other pet peeves on Twitter @girlsgonesporty.